Related to some earlier posts on cut-ups and William Burroughs, I received a very high quality art book published by The New Museum called Brion Gysin - Dream Machine. Brion Gysin is the person who introduced Burroughs to the Cut-Up technique. They carried on a very productive artistic collaboration for a number of years experimenting with all kinds of artistic media and magic. The New Museum will present “Brion Gysin: Dream Machine,” the first US retrospective of the work of the painter, performer, poet, and writer Brion Gysin (born 1916, Taplow, UK–died 1986, Paris). Working simultaneously in a variety of mediums, Gysin was an irrepressible inventor, serial collaborator, and subversive spirit whose considerable innovations continue to influence musicians and writers, as well as visual and new media artists today. The exhibition will include over 300 drawings, books, paintings, photo-collages, films, slide projections, and sound works, as well as an original Dreamachine—a kinetic light sculpture that utilizes the flicker effect to induce visions when experienced with closed eyes. The show runs until October 3rd and I'm told that it's "really good." Bill Laswell and John Zorn played the opening. I remember first experimenting with the flicker effect when I was about 12. It wasn't a Dreamachine, though. My technically talented friend Steve, same age as I, made a device using a piece of cardboard that had a hole cut out placed on an old turntable with a light shining through it from the back. He had also figured out how to vary the speed of the turntable, and along with trying different ways of placing the holes in the cardboard, had learned how to produce varying frequencies of light emission. It was quite effective. Steve was also the first person to introduce me to the powerful mood changing effects of audio manipulation. We recorded the Beatles Revolution #9 onto a cassette tape. Steve was able to take the cassette apart and flip the spindles so that it would play backwards when reassembled. The effect was incredibly spooky such that I felt brought into another world or at least shown the entrance. A strange space that had different rules of physics than I was used to. A little unnerving, to say the least. Are we not all dead? The answer is yes, yes. Turn me on, dead man. Turn me on, dead man. said quickly with an English accent. Some people related it to the whole 'Paul is dead' urban legend which was still in the air. I don't think it had anything to do with that, at all. to say good silence by -- good to say by silence-- by silence to say good-good & good-bye." To me, this phrase evokes the liminal space between dream and waking, death and life, that, ultimately, I was trying to map in my work of 2005-2007-- the space behind your eyes as you fall asleep, or as you wake, that can contain fear and death, or birth and life." It's interesting that Sue De Beer says that she 'was trying to map' that space. She's not the only one. In her account she talks about building and using a Dreamachine then writing down her visions. There used to be a Dreamachine in the control room area of Laswell's Greenpoint Recording Studio. I don't know what happened to it after the studio moved to Orange Music. Greenpoint also had an Eye of Horus design set on top of a small bell. Bill gave it to me at the time of the studio's transition. It's still in my possession. I feel a particular connection to Brion Gysin because it was Gysin who first brought The Master Musicians of Jajouka to the attention of the world. He had chanced upon them in the early '50's while travelling around Morocco with Paul Bowles. Their music moved him so much that he opened a restaurant in Tangier called The Thousand and One Nights just so they would have a place to play. He said it was music that he wanted to hear every day for the rest of his life. A highlight of my sound career was recording the Master Musicians of Jajouka in Jajouka. I would say their music extensively surveys and maps liminal spaces. More on that story another time. Recently received the finished cd from two of my favorite Bay Area musicians, Dave Pellicciaro and Dale Fanning. Together they construct and operate Materialized, a unique amalgam of electronica, funk, jazz, and space - interdimensional traveling music for the XXIst Century. Dave plays all varieties of keyboards: synthesizers, Hammond B3, Rhodes piano and samples. He also charted the horn arrangements and took on the bulk of the production workload. Dale plays all varieties of drums and percussion, acoustic and electronic. He also contributed to the production. They get some help on the bass guitar with Carlitos Del Puerto who has previously played with Herbie Hancock and Stevie Wonder among others. A horn section comprised of: Mic Gilette, Dave Carter, Beth Custer, and Tim Carless along with Mimi Marchall on percussion round out the musical contributers. 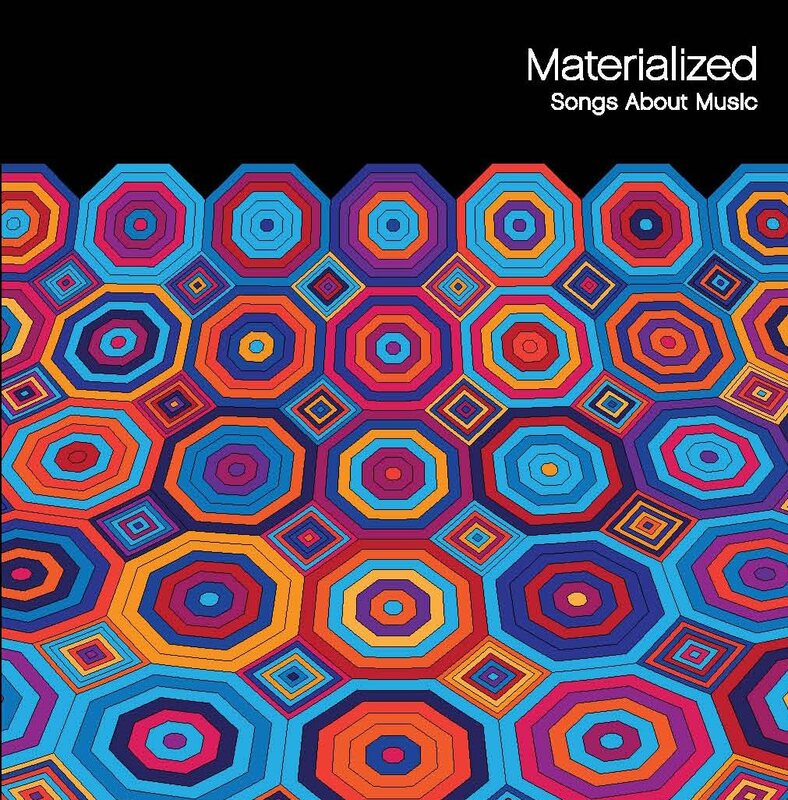 Dale and Dave chose the name Materialized for a few different reasons, one of them being an homage to Bill Laswell's Material. This could be one reason why I found their cover art so compelling. Yesterday I was being interviewed on the internet station Gorebagg TV and was asked to describe my impressions of entering the Moroccan village of Jajouka to record the Master Musicians of Jajouka. I was trying to describe the unique phosphorescent blue color of many of their buildings. The lighter shade of blue on the Songs About Music cover matches it closely. This art has a very Moroccan feel about it, to me. Allusions to ordinary and nonordinary travel abound on Songs About Music. The song titles give it away. The introductory track, a :26 second noise piece, conceptually prepares and tunes the listener in to what follows. Track 2, Flying Blind, launches into some hard hitting techno funk that rolls, flows, voyages and takes you on a journey to ...? Go there and find out! Flying Blind may be true, especially at first, but the trick to know is that the more we fly, the more our vision increases. The 3rd track, The Ladies All Know consists of an interesting non-verbal communication. It's a short interlude which leads directly into #4, The Brightness of Now, a showcase for Dave Pellicciaro's jazzified funk, B3 Hammond Organ playing. Another interlude piece follows called Noon Tomorrow? a title that derives from Dave and Dale's rehearsal timing marker. Next is The Witness possibly referring to witnessing the sights and sounds of extraordinary travels. Like much of their music, this song evokes strong visual imagery. Choose Your Yestination, #7, reminds me of the bardo space of choice points where one previews future incarnations in order to choose one's next lifetime. Dave has this to say about the 8th track, The SP: Yes, The SP is in fact for our urban lil landscape of San Pablo Ave goin from Oaktown to El Cerrito! Busy/Crazy Soundscapey out by our end o’ the hood. The cd closes with Sun Can't Hide The Dark, a warm, organic jazz anthem. The album was recorded and mixed at Lucky Devil Sound, Dave Pellicciaro's studio located in a large loft space near the border of El Cerrito and Oakland. I was brought in to help with the mix. Since it was to be mixed in a Pro Tools HD system without an external mixing board, I advised Dave to purchase a 2 Bus summing mixer which allows the Pro Tools tracks to be assigned to separate outputs. Summing the tracks inside Pro Tools program for a final mix, known as 'mixing inside the box' is something I try to avoid at all costs. Track summing inside of DAWs (Digital Audio Workstations) is their weakest link. Fortunately, Dave took my advice and picked up a Dangerous 2 Bus summing mixer. I've used the Dangerous before and am very happy with the way it sounds. Another critical piece of gear Dave acquired for these mixes was a pair of Klein and Hummel O300 near field monitors and the Klein and Hummel O800 sub-woofer. These hi-end monitors worked great for me! Very accurate and detailed without sounding hyped. Good monitoring is one of the most important elements for achieving successful mixes. I'm very picky about how I listen, and was very impressed with the K&H's. Also very important for the invocational aspect of the mix is the aesthetic of the mixing environment. Not only in terms of acoustics but everything that goes into influencing how one feels about working in that particular space. Lucky Devil Sound is a very clean, organized and well maintained environment. The high loft ceiling creates a sense of openness and helps with the acoustics. Tasteful art on the walls seemed aligned to the direction Materialized was taking their music in. All together, a very comfortable and pleasant room to work in. I don't live in the Bay Area, so consequently need accommodations provided when working there for any length of time. Dale, very generously, allowed me to use his apartment which was set high in the Berkeley Hills. The view, overlooking the entire San Francisco Bay Area, was quite spectacular and inspirational as I gazed upon it like some huge organic yantra while engaging in my late night and early morning prayers and meditations. Electric at night with all the lights, more earthy in the day with the trees, foliage, and landscaping becoming more prominent to the eye. I mention the living quarters because it has an influence upon the functioning of the human biological machine operated by yours truly and thus affects the quality of the work. Optimization of the Materialization. I'm very excited about Songs About Music. It has a lot to offer for the intrepid explorer of musical dimensions. Some of it is available to stream here. It's currently in the process of being added to CD Baby, Itunes and other download sites. Hard copies will be available. I'll post more purchase info as it becomes known to me. Just back home from a marathon mixing session of superb Hawaiian roots reggae from Guidance Band. The session was much more marathon than it should have been due to file mismanagement. Fortunately, the music, all of it tuned to Jah in one way or another, was sustaining. Another producer, responsible for adding in the dubbed out bits in a different studio, was unaware of the "Save As" function in Pro Tools that allows you to completely transform a session while staying linked to the original audio files. Instead, he set-up brand new sessions but with a different format, wav instead of aiff, and a different sample rate. The end result being that when we brought up his sessions, none of the audio files linked up, hence, no sound. So 8 of the tracks didn't have any usable audio. But as fate, destiny, Jah, luck, or quantum indeterminacy would have it, studio manager Andrew Mastroni had arranged for Matt Wright, Prairie Sun's Pro Tools ace, to help us get started. He reconverted the files that allowed them to link to the dubbed out sessions which basically saved the day. Since the dubbed efx were already there, I only had to get sounds and a good balance mix of everything... oh, and find critical files that the dub producer had deleted, which, luckily, still existed on the drive and could be reimported. Guidance Band won a Marijuana Music Award for Best Reggae Song in 2007 on the last album I mixed for them. About half, or maybe more, of the songs on this new album could win again. "The only woman awake is the woman who has heard the flute..."
This recalls the idea of "bringing the woman to life" as an alchemical/transformational modus operandi. There's at least a million or maybe 6 billion plus ways to look at it: in performance, the audience could be the 'woman' who awakens upon 'hearing the flute' ie real music from the heart and soul. Woman, in these instances refers less to biological gender, and more to principles or tendencies found in nature. The joy of playing the flute, the joy of playing music, is to bring the woman to life. Several times in this illustrious career things have happened where I thought, 'this is it, it's all over.' Like Terry Gilliam, hearing of Heath Ledger's untimely death in the middle of filming "The Imaginarium of Doctor Parnassus," immediately thinking, 'well, that's the end of this picture...' But with the generosity of friends and a higher Will the film got made and I highly recommend it. One such instance nearly ended my relationship with Bill Laswell and Material before it even started. We were mixing in Platinum Island's Studio East on a 72 channel G Series SSL desk that was only 6 months or so out of the factory. For non-technicians: the SSL is a computer automated mixing board that will remember and play back every volume level change you make. The computer can also take a picture of nearly every single fader and knob position so that a mix can be set-up then recalled at a later date. That function is called Total Recall. Mixing on an SSL, when all is well, is like driving a Caddilac, though I've seen some engineers, such as Jason Corsaro, drive it like a Ferrari. Everything went smoothly at first. Bob spent a few hours getting sounds and setting up a basic balance of all the tracks. Then Bill sat at the SSL and made a few adjustments with the faders before they started to automate the mix. Bob operated the computer while Bill automated the mix faders, usually one at a time. My job, at this point, was to keep an eye on Bob to make sure he was ok with the computer commands. With this system, it was fairly easy to lose information through human error if the operator wasn't completely familiar with SSL's somewhat idiosyncratic automation procedures. They worked on the automation for a few hours, at least. Bill was using the automation more extensively than anyone else I'd seen do it. This brought a lot more dynamics to the sound and made the mix breath in a way that gave it excitement and life. I was reminded of Brian Eno's concept of the recording studio itself being a musical instrument. Now I was in the presence of someone actually taking it to this level. Using the automation this much did eat up a lot of memory but still safely within system parameters. However, at the end of one pass, it crashed. Not only was the pass we'd just finished lost, but it crashed the entire floppy disk where all the previous mixes were stored. This meant that the last few hours of work had been completely lost. The mix had been almost finished. We brought a maintenance tech in who was unable to determine what had gone wrong. The computer worked just fine when the tech tested it with a new disk. "Maybe it was just a bad disk", he said. Bill and Bob persevered and began building the mix again with automated passes. After about 90 minutes the computer crashed again. It seemed like when it reached a certain memory capacity, it couldn't handle anymore load although there wasn't any logical explanation as to why it wasn't working up to capacity. Bob had been giving all the correct commands and doing everything absolutely right with the computer. Fortunately, they'd booked 2 days for this project. "We're leaving," Bob said, "you guys can figure out what's wrong over night and we''ll come back tomorrow and finish." Our Chief Tech, Carl, who incidentally was also Les Paul's tech, came in with his minion, Mike, to track down the glitch. They couldn't find anything wrong and insisted the problem was human error ... not theirs, of course. Luckily, I'd been paying attention to Bob's automation operation the whole time and could vouch 110% that he'd done everything by the book. I argued this point with the techs. They insisted it was human error and said that was that! In my opinion, they were just covering themselves. This problem hadn't come up before because noone else used the automation this creatively. So there I was faced with the a problem that required a different kind of solution. I was very concerned that the computer would crash again the next day shutting down the mix forcing Bill Laswell to take his business elsewhere. The next day I arrived for the session an hour earlier than usual. It was standard operating procedure to get there one hour before the start time, I got there 2 hours ahead of time. I cleaned the space then proceeded to practice the Lesser Banishing Ritual of the Pentagram which I'd learned from the Golden Dawn system of Magic. The intention with this is to banish any influence inimical to what you wish to do in the space. I wished for a successful mix! I did this ritual a couple of times just to be sure. Bill and Bob arrived and began working. So far, so good! I tried to keep my will focused throughout the session on not allowing any disruption. Luckily, the computer behaved perfectly and we got a final mix on Family Affair with no additional complications. The next day a large label project began a 2 week lockout in Studio East. They were paying top rate, which was about $2200/day back then. Thankfully, I wasn't booked for this one. They worked 10 hours before the computer crashed losing all their work. The client immediately pulled the project and the studio lost all that revenue. properly resulting in the malfunction. Early on in this noble sound arts path I was fortunate to work on Danzig's self-titled debut album. They did a week of overdubs at Platinum Island with engineer Steve Ett and producer Rick Rubin. Rubin had recently parted ways with Def Jam partner Russell Simmons to form Def American Recordings. Danzig was the first release on the new label. Steve Ett was a bit of a legend for having masterminded the original Run DMC recordings which brought rap music to a much wider audience. He was basically Def Jam's house engineer in the beginning. Steve was easy-going and pleasant to work with. Glenn Danzig and guitarist John Christ were the musicians for these sessions. Danzig brought in some black magic looking occult paraphanalia to create an atmosphere. I remember a skull of some sort and a picture of an inverted pentagram on their posters. I regarded them as theatrical props and didn't take them too seriously. Never did hear or see anything to indicate that anyone with Danzig possessed more than a superficial knowledge of the occult. The point was driven home when I showed up for a session wearing a t-shirt with a 5 pointed star, a pentagram. Glenn said that my shirt was upside down - meaning it should have been an inverted pentagram. The studio's outboard rack had a pair of Lexicon PCM 42 digital delays which display bright red LED numerical readouts. Danzig set both of them to read 666. 666 can be a scary number for anyone heavily invested in Christian apocalyptic mythology as it's the number of the Beast, the Anti-Christ. A qabalist might say that it's merely the triple expression of the number 6, the number of the Sun. So I wasn't worried. After all, John Christ was there and he didn't appear to fragment apart or spontaneously combust. Actually, he played great. You'd think the Anti-Christ would affect all Christ's, not just the famous one they put on a cross. I really enjoyed Danzig's music and working with them. Rick Rubin gave them some excellent direction communicating his feeling for simple and clean, basic, bluesy hard rock. The album has a great version of The Hunter which most people recognize from Zeppelin's first record. The song Mother also did very well. I kept a copy of the rough mixes and listened from time to time. Still haven't heard the finished version yet. During the week of Danzig sessions, I never caught a feeling of a weird black magic vibe. The next day, however, I was tracking another artist to a Studer A80 2" multi-track recorder. I was operating the remote control. We had just reached the end of a song after numerous punch-ins on a pair of tracks, when the logic of the remote control went haywire. On its own, it went into rewind, went back to the memory location at the start of the song and went into record, effectively trying to erase what we'd just tracked. It wouldn't respond when I pressed the STOP button, so I immediately powered down the remote and manually stopped the A80 thereby saving the tracks. Sometimes the Studer remote would reset and work again after powering down, but this time it had to be repaired by a maintenance technician. Who knows if the Danzig atmosphere contributed to the chaos? To my knowledge, it was the only time this problem occurred during my 3 year tenure at Platinum Island. JUST RELEASED by Tzadik Books- a very interesting new work edited by John Zorn. Mysticism, magic and alchemy all come into play in the creative process. For centuries musicians have tapped into things spiritual, embracing ritual, spell, incantation and prayer deeply into their life and work. Although the connection of music to mysticism has been consistent, well documented and productive, it is still shrouded in mystery and largely misunderstood. For this special edition, Arcana focuses on the nexus of mysticism and spirituality in the magical act of making music. Far from an historical overview or cold musicologist’s study, these essays illuminate a fascinating and elusive subject via the eloquent voices of today’s most distinguished modern practitioners and greatest occult thinkers, providing insights into the esoteric traditions and mysteries involved in the composition and performance of the most mystical of all arts. William Breeze aka Hymenaeus Beta, the leader of the O.T.O. Genesis P-Orridge, formerly of Psychic TV. Peter Lamborn Wilson, Sufi expert, guerilla poet, angelologist. Terry Riley, avant garde composer. Fred Frith, one of the world's best guitarists, experimental composer. David Toop, premeir writer on ambient music. Sharron Gannon, Jivamukti yoga teacher and musician. Milford Graves, top, distinctively original, experimental jazz drummer. And quite a few others. It's a 460 page softcover edition. Available here. Click on "Books" on the top right. The first post in this series is called William Burroughs in the Studio. Start there for the complete story. How to Survive Death seems a prominent theme of Seven Souls. It comes across in the words William Burroughs speaks from his book, The Western Lands. The poignancy of this recording and the magick around it are possibly due to Burroughs' necessity for this information. He was 75 at the time, clearly aware of his body's mortality. British we are and British we stay. where mustached riders with scimitars hunt tigers. The ivory balls one inside the other, bare seams showing. The long tearoom, mirrors on both sides. shops selling English marmalade and Fortnum and Mason tea. Clinging to a rock like the rock apes, clinging always to less and less. In Tangier, the Parade Bar is closed. Shadows are falling on the mountain. This passage, which also ends Seven Souls, was not one of the selections Bill Laswell chose. Burroughs, or something, felt compelled to include it. Perhaps something to do with the old writer's necessity and willingness to confront death. This was no academic exercise. In his last journal entry before he did die, seven years later, William Burroughs describes love as "the most natural painkiller that there is." At another Seven Souls session a few days later, Bill Laswell and Nicky Skoplelitis arrived with a number of books they'd just picked up. Bill set them up on the ledge against the wall of the control room. I took them to be research materials. One of them jumped out. It had a bright red cover with thin black lettering that read The American Book of the Dead. This was my first exposure to this book by E.J. Gold. It was soon to play a significant role in my researches. Death was a subject I had been investigating for over 5 years before meeting Bill Laswell and William Burroughs. My interest in death first piqued at a time when I was feeling depressed and despondent over the seeming inability to effect any real change in my life. I was probably guilty of taking P.D. Ouspensky a little too seriously from reading The Fourth Way, his erudite study and application of Gurdjieff's system. The book is good at bringing home the point of the mechanical nature of ordinary life, especially the self-observation of one's own robotic nature, but, for me, it lacked any practical solutions to the dilemma. One day, not knowing what to do, I picked up a copy of Carl Jung's Collected Works and opened it at random. The oracular method of bibliomancy, sans Bible, has often proved effective. Now, nearly 30 years later, I don't remember exactly what the passage I turned to said, but the gist was: In many tribal cultures, death is used metaphorically and symbollicaly for rituals marking rites of passage and other major life changes. Jung talked about the death/rebirth archetype. How, in many different cultures, there always seemed to exist beliefs of some kind of rebirth connected with death. Death as a metaphor for causing change to occur in accordance with Will, finally gave a place to work from. A practical method of transformation. Die to the old self, take rebirth as something new, to simplify it greatly. The secret to success is in learning to navigate through the 'land of the dead,' or the 'bardo', as it's also known. A general effect of using death ritually and transformationally is to give a much greater appreciation for life. Training to handle death brings vitality and potency to life. Anytime a musician really connects with music, or anytime anyone successfully meditates, they undergo a "death" of their everyday personality. Sound can act as a painkiller. At date we do not have music sufficiently powerful to act as a practical weapon. The second line is now up for debate, but that's another story. 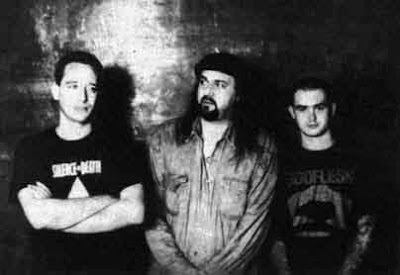 In 1991, days before the first Gulf War, John Zorn formed an improvisational trio with Bill Laswell and drummer Mick Harris called PAINKILLER. Mick was an original member of Napalm Death. It started as an experiment, a one-off recording done at Laswell's Greenpoint studio. The recording went very well, the chemistry between the three of them clicked right away and some extremely powerful music flowed through them, all of it composed on the spot as they performed. A whole album worth of material was tracked in the first session. rising in pitch and intensity. SCUD MISSILE was all over the news. I recall it getting mixed in two sessions. Coincidence Control along with Mick's scud prognostication, if you like. Once, using a qabalistic process called gematria which transliterates letters into numbers, I analyzed the word 'painkiller' as God's music. A collage seems the perfect choice for the cover of this music for a few different reasons. The music itself is very collage-like especially when looking at the album as a whole. The musical elements and influences it weaves together include: Moroccan, West African, Illuminated Hip Hop, found sounds of Gospel preachers off the radio, funk grooves, and the spoken literature from one of the more rigorous modern explorers of consciousness. Much of Burroughs' work collages words and images especially when it employs cut-up methods. Cut-up writings introduce randomity and chance operations into the literary process giving a great abstract effect. Collaged cut-ups and juxtapositions create new realities. David Bowie is another artist who has used the cut-up technique to inspire creativity. The tracks Ineffect and Equation contain music cut-ups. Collages, especially this one, also effectively convey the feeling of travel through the Land of the Dead. The Land of the Dead, known by the Tibetans as the Bardo, is the primary theme of Seven Souls. Shinro Ohtake takes the world as his source, using journeys, dreams and diaries to examine the inner surface of his layered perceptions. The coincidence with the art was told to me last year at a Material concert at an incredible Austrian winery. This version of Material featured the songs of Gigi, Laswell's beautiful Ethiopean wife. After the show, a dedicated Laswell fan, someone who will travel with his wife to see Bill play anywhere in Europe, whose name I neglected to collect, told me about a time when he visited Japan and happened to end up at a party at the house where Shinro Ohtake's original painting of the Seven Soul's collage lived. He walked into a room and there it was, quite the surprise. He recognized it immediately and starting telling the people around him the connection of the painting with Seven Souls. He also explained who Bill Laswell was. Unbeknownst to the raconteur, Bill also happened to be in Japan and, quite remarkably, turned up at the same party. Bill walked into the room that had Shinro's painting immediately after the fan finished talking about him. It was almost like Laswell had been invoked into physical appearance. For a life-changing project like Material's Seven Souls, it only seems natural, yet still astonishing, that there would be significant meaningful coincidences, ie synchronicities, continuing in effect years later. To start: I mentioned giving Burroughs Wilson's Coincidance : A Head Test shortly before he left with Grauerholz to visit Keith Haring. Haring was dying of AIDS, at the time, and didn't have long to live. Kind of an appropriate person to visit after you've recorded material on death and the technology of immortality. only less figurative and more abstract. The characters he had painted all over the walls reminded me of strange letters from an unknown alphabet. Haring hieroglyphs, if you will. Six months or so after the Seven Souls session with William Burroughs, a new book of his arrived in Platinum Island's mail. It was called Interzone and consisted of Naked Lunch out takes. It had come to Platinum Island by mistake addressed to Haring's studio two floors above. By this time, Keith had shed his mortal coil. The studio manager picked up the book, saw that it was addressed to Haring and said to me, " He won't need this anymore. You're into Burroughs, you should have it," and then gave me the Interzone book. The upshot being that I had given WSB a book, Coincidance, and six months later a book from him came in return. The first session I ever worked on with Bill Laswell's Material involved recording legendary Beat writer, William S. Burroughs. I had worked on a couple of previous projects with Laswell and his engineer, Robert Musso, at Platinum Island, the studio where I worked . They were mixes of albums by two experimental jazz artists, Yosuke Yamashita and Ronald Shannon Jackson. At the time, I only had a vague notion of who William Burroughs was. Knowing of the session a few weeks ahead of time, I purchased a number of his books to become more familiar with his work. However, the 80-110 hour work week schedule as a staff engineer at a top New York studio prevented me from reading any of them except his first one, Junky, not exactly the best one for learning about Burroughs. The result being that I had absolutely no clue that I was about to see someone extraordinary. I will never forget when we met. I was in the lounge when the studio manger escorted Burroughs in. As we shook hands, I had the very unusual experience of everything seeming to disappear except for the presence of Burroughs and myself. For a brief moment, it seemed like nothing existed except WSB and myself surrounded by white space. Definitely not what I was expecting. The music tracks he was going on were originally made by Laswell and Nicky Skopelitis for the follow-up to the generic Public Image Limited (PiL) album Bill had produced for John Lydon (Johnny Rotten) in 1985. Laswell and Lydon had a falling out over creative differences, the main difference being that one of them wanted to be creative. At Musso's suggestion, I had set-up a table with a lamp to get Burroughs feeling like he was doing a public reading where he usually sat at a desk. A vintage Neumann tube U47 microphone was suspended on a boom upside down with a wind screen and tilted slightly in front of the writer. We recorded him onto a Studer 1/2" tape machine running at 30ips with no noise reduction. Every now and then Burroughs would take a break and come in to the control room for a playback. His companion, James Grauerholz, would usually say something to the effect of, "great job, William, you're really doing well, etc..." Burroughs would either not respond to the compliment or grunt something inaudible under his breath. After the third or fourth time of Grauerholz giving praise, Burroughs became visibly perturbed and raised his voice saying, " IT'S NOT ME! IT'S NOT ME!!." What little I knew of WSB came from Robert Anton Wilson's book Cosmic Trigger. 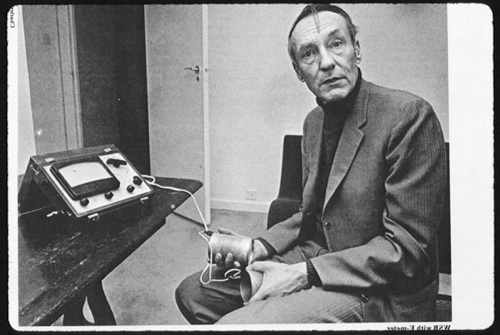 Wilson's current release at the time Coincidance : A Head Test, contained experimental writing that used computer software to employ the cut-up technique that Burroughs had popularized with friend and collaborator, Brion Gysin. I brought my copy and asked Burroughs if he'd seen it. He hadn't, so I told him about the software cut-ups and showed him the book. He became very interested, so I told him he could keep it. Contradicting his dour reputation, he lit up in delight like a kid who has just received a wonderful present. He said that it was perfect because he didn't have anything to read on this trip or time to pick something up. Then he started talking fondly about having met Bob Wilson at some sort of panel discussion in the '50's. Burroughs and Grauerholz left shortly after to visit Keith Haring who had his art studio two floors above Platinum Island. 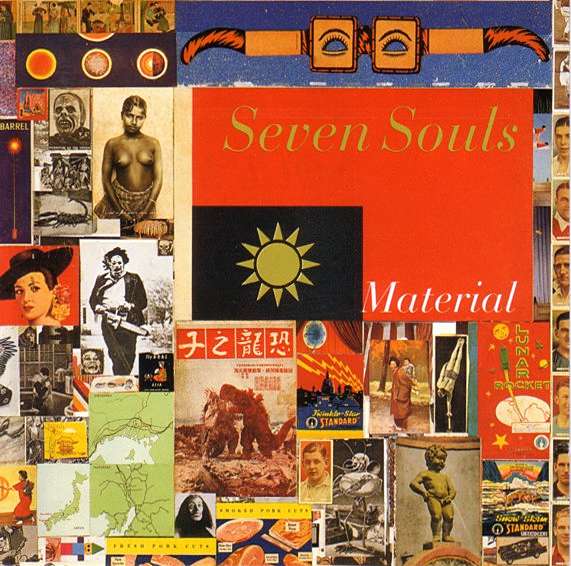 The recordings Burroughs made that day appear on the Material album Seven Souls. Don't know if they're related, but I experienced both on the same night many years ago in the Canadian mountain resort town, Jasper, Alberta. Don't recall the exact date but do remember it being after Led Zeppelin's In Through the Out Door was out, and shortly before John Bonham died, which places it in the late summer of 1980. I was working for a band called Sargent, who was booked in the local rock club for a week. Our employers put us up in a duplex townhouse about a mile and a half from the hotel where the club was located. They also booked entertainment into the hotel's lounge. The one-man-band lounge singer guy was staying in the other side of the duplex from us. One night after the show he tells us this incredible story. Seems he was playing Stairway To Heaven - a very courageous thing to attempt in a lounge imo - when a middle-aged lady approached him after and said, "Thank-you very much for playing that song. My son James wrote it." He said that she was very polite and low key but seemed genuinely appreciative. We told the lounge guy that if she happened to come back, to please invite her downstairs where we were playing thinking it pretty unlikely that we'd ever hear of her again. Much to our surprise, she returned to the lounge and the singer brought her to meet us. I remember she said her name was Patricia. She said she was on a holiday trip from Wales where she lived. She was soft spoken with a light accent; very clear, direct, and down to earth. Not at all pretentious but almost beaming with pride at the accomplishments of her progeny. On break between sets, she told us stories about her boy, James. She always referred to him as James. She mentioned his two teen-aged friends, Eric and Jeff, who also had a passion for playing guitar. That would be Clapton and Beck. Apparently Eric's and Jeff's parents weren't keen on their musical activities and wouldn't let them practice in their homes. Patricia was fine with it, so the three of them would gather in the Page house to practice their guitars. Patricia said that now, ie 1980, Page was very secluded and wary of people's motives toward him and his wealth. Seems lot of obscure relatives and other hangers on came out of the woodwork after he got famous. She said that he considered Stairway To Heaven to be his finest achievement as a songwriter. She stayed for one of our sets and then said goodbye. We asked her if she'd like some earplugs - it was a small establishment and the volume was strong. She declined and had no problem with the loudness. I guess if you've seen Led Zeppelin a few times you get used to it. I felt incredibly high and elated walking by myself back to the rooms afterwards. Everyone else drove. It was a beautiful, slightly cool night in the mountains. The air was fresh and crisp. Suddenly I noticed 3 brightly colored lights streaking across the sky. They could have been planes flying in formation except that I couldn't see any kind of craft, and they appeared to be going extremely fast. I remember that they were different, intensely bright, pastel colored lights. My memory has them as pink, yellow, and green. Their trajectory arched across the sky. I thought they might be missiles and half expected an explosion when they disappeared over the mountain range. There wasn't, nor do I remember any sound associated with them as they flew across like you'd expect from a plane. So I continued walking home, grateful that the world wasn't ending just yet. I was about halfway there still buzzing from the contact with Jimmy Page's mother. Led Zeppelin had more influence on me growing up then any other band. They were the main musical component of my High School cultural education. I was 17 when their film The Song Remains the Same came out. It was playing at a theater about 3 miles down the road from the house I lived in. Once a week, for 7 weeks, I'd go see it, usually with friends, but sometimes alone, informally experimenting with what, I later realized, was Timothy Leary's/Bob Wilson's neuro-electric reprogramming recipes. Later, when I discovered that Page appeared adept with Aleister Crowley's system of Magick, I wondered if these ad hoc shamanic adventures might have opened doors enabling receptivity to Magick. The person who introduced me to Robert Anton Wilson, Aleister Crowley, and Magick, was Bob Gregory who ran the lights for Relay. When I got back to the band house the requisite winding down, socializing was going on. Everyone was still pretty excited. In all the hub bub, I had temporarily forgotten about the 3 UFOs until an announcement came on the radio saying that many people had called in to report strange lights in the sky. The next day the news reported that a Russian satellite had fallen out of the sky, that this accounted for the lights. This seems a weak explanation to me as it's unlikely that a satellite would randomly split into 3 pieces appearing in formation and reflecting a different band in the light spectrum. Also, there was the distinct impression of an intentional trajectory. Well, I have no idea what connection, if any, these two events have except they took place on the same night. Some researchers, like Kenneth Grant, connect UFO phenomena with the occult. I don't know. The jury is out on that one. I just heard that Rammellzee, a truly original artist, died this past Sunday. He was one of the original grafitti artists, a friend of Jean-Michel Basquiat, and was called a pioneer of hip-hop music. Randy Kennedy wrote a good piece on him in The New York Times. In 1984 he had a small part in the Jim Jarmusch movie “Stranger Than Paradise” as a kind of deus ex machina, bearing a cash-stuffed envelope toward the end of the film. In an interview in The Washington Post the year the movie came out, Mr. Jarmusch said he considered Rammellzee a mad, overlooked genius. "Ms. Zagari Rammellzee said his illness had slowed him down over the last few years and prevented him from pursuing a prodigious list of ideas. But she added that he never viewed death as an end, only a change in forms." The Times didn't mention that Rammellzee was also a member of Bill Laswell's loose collective of musicians known as Material. His track on Material's Seven Souls album is called Equation. He reminded me of someone out of time, like a visitor from the future who got caught in the backwaters of time but turned it into a creative advantage. We have nothing else but to say and leave a retreatable rhyme that can only be so far back in time that your mind will turn to will washes and bubblegum factories. "So far Hazrat Inayat Khan's The Mysticism of Sound and Music has been extremely influential as well as my studies into the Native American Way and Shamanism among others. Like you said, my experiences in the Sweat Lodge Ceremonies and Native American Peyote Ceremonies have offered far more than any books could have. Cymatics has always been extremely interesting to me because it seems to prove that matter is animated and structured by vibration - the implications for music and its effects on humanity are profound." Thanks, Dash! Nicky Skopleitis gave me Khan's book awhile back but I didn't really connect with it at that time. I'll have to give it another go. This is the first I've heard of Cymatics. It sounds closely related to Gurdjieff's ideas as outlined by Ouspensky in In Search of the Miraculous. The Bear Comes Home - Rafi Zabor. A heady mixture of jazz music and culture, and Sufism from an adept of both. Zabor worked with Reshad Feild's school at one point. Finnegans Wake - James Joyce. A difficult, mind expanding study that can take years to appreciate, but is well worth the effort. Joyce was a good singer and wrote as musically as he could. The secret to hearing its music is to silently sound out all the coined words and phrases. It's easier to approach and understand the Wake as an incredibly complex piece of music than it is to follow a storyline. Joyce was a visionary qabalist and had a profound understanding of magick as evidenced in Finnegans Wake.